COLOR(S): Black or dark brown. The Curly-Coated Retriever is a strong, smart, upstanding dog showing activity, endurance and intelligence. Their body is covered with a tightly curled coat which does not need trimming, supposedly descended from the Poodle. They are medium to large sized dogs, the size of any Labrador retriever, with a muscular body and strong fore and hind limbs. Their entire body except for their face and paws (and lower legs) are covered in tightly curled ringlets, which make it an exceptional water dog as their fur does not need drying after a jump in the lake. They have dark, almond shaped eyes and ringlet-covered drop ears. They have deep chests, long tails and big hearts. Curly-Coated Retrievers have an excellent nose and a good memory. Bred for retrieving quail and waterfowl, they are superb swimmers with great stamina and they know how to carry dead or wounded animals gently in their mouth. Curly-Coated Retrievers have also been known to work over difficult terrain, quite often in the Australian outback or wilds of New Zealand. They are even tempered, immensely alert when at work, and very determined in what they do. They can be playful, energetic, and adaptable to their owner's temperament. Although slightly reserved with strangers, they remain loyal and friendly to friends and family. Curly-Coated Retrievers are responsive, friendly, affectionate, and proud. They are very energetic and playful, but are also adaptable and adjust to their owner's mood. The Curly-Coated Retriever is better at guarding than other retrievers, and is generally a very good obedience dog. They can be scrappy when in the field with other dogs, but are very trainable. They are affectionate with family, reserved with strangers. Curly-Coated Retrievers enjoy children and get along with other pets. Minimal coat care is required for Curly-Coated Retrievers. 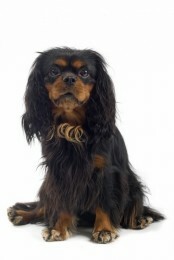 Their coats do not grow to a shaggy length, are water-resistant, and dry quickly. Periodic brushing is all that is needed. All the coat needs for cleaning is to be damped and massaged in a circular motion. Cancer, hip and elbow dysplasia, and skin disorders such as Alopecia. Other health concerns include eye problems such as cataracts, entropion and ectropion, as well as bloat. Bloat is a health issue to most dogs, being the second largest killer of dogs other than cancer, but Curly-Coated Retrievers can be particularly susceptible to it because of their deep chests. Rigorous exercise is needed, however, and consists of a long daily walk, outdoor activity, such as fetching sticks, and swimming. An intelligent breed, Curly-Coated Retrievers need training that will be a challenge as monotony will cause them to lose interest. If this breed does not get enough exercise or work they can be very badly behaved.